Toca Life: Stable is one of the iPad apps in the Toca Life series. I have previously reviewed Toca Life: City, Toca Life: Town, Toca Life: Farm, and Toca Band by the same developer. Toca Boca want kids above all to have fun and create and I think that comes across in their apps. 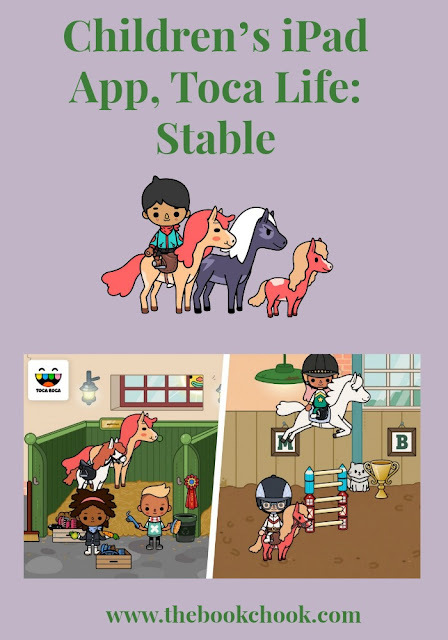 Toca Life: Stable is ideal for kids who love animals, especially horses. What kids wouldn’t want to role play horse-related activities? They can groom ponies, saddle them and try them out over jumps. They can try horseback camping in the woods and swim near a waterfall. The shop is easy to visit and there’s no need for money - just grab harness, helmet, grooming brush and the like and take it wherever you go. I love the digital toy aspect of this app. It’s similar to what I did as a child with plastic horses, tiny dolls and shoe box houses. Nostalgia makes me think those days of creating our own props were great, but I know a young Book Chook would have trampled over any shoe box to get to everything this app offers. There’s an emphasis on creativity that’s terrific as well. Kids can narrate while they move characters and props to create little movies. There are also cute surprises - lily pads can make music - and fun - wait until you see the porta-potties! This is a great app for horse-lovers and for parents to share and explore with their kids.